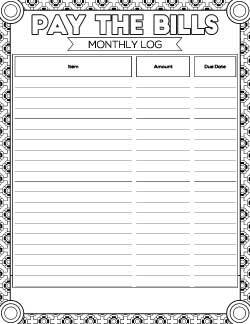 Snag a printable bill payment checklist and keep better tabs on your finances! Take your pick from several monthly bill payment organizers and bill pay trackers. I recently mailed a check waaay ahead of time because I’m paranoid about things getting lost in the mail. It’s one of the few payments we don’t have an electronic transaction set up for and I don’t want to have it arrive late! I got hit with a late payment fee once because I remembered the due date incorrectly and I’ve made sure I never let it happen again! Like many people, we primarily use paperless billing. 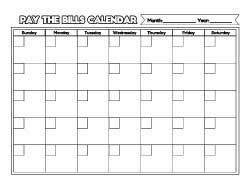 This saves paper and clutter, but it can make it even tricker to keep track of when everything is due! 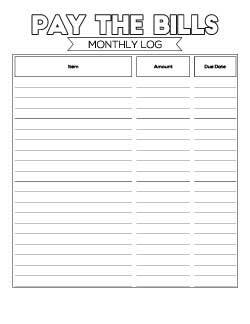 That’s why today I’m sharing a bill pay checklist for you to print off. 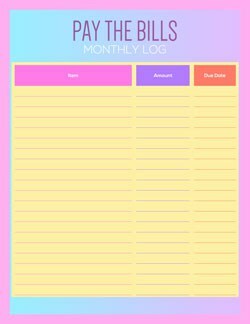 Actually, I have 9 free printable monthly bill payment logs for you so you can pick whichever best suits your needs! 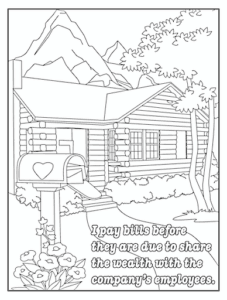 I’m also sharing two wealth mindset coloring pages to help you feel better about bill paying time. There are three different styles of printable: a monthly bill organizer, a monthly bill payment calendar, and an annual bill payment checklist. Each style of printable is available in three different options – one plain, another with coloring page elements, and a third with lovely colors already added. You can navigate using the table of contents below, or keep scrolling to make sure you don’t miss out on anything! 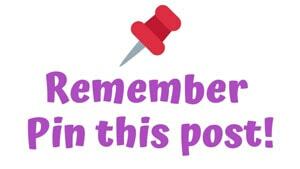 This post may include affiliate links, which means I may make a small commission on items purchased through these links at no additional cost to you. 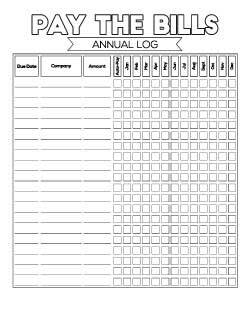 Remember to Pin these bill tracker printables so you don’t lose track of them! The coloring page printables are saved at full 8x5x11 size for marginless printing. If you don’t have a marginless printer, simply check “scale to fit” so none of the design is cut off. The colorized versions are also designed for full-page printing. You can scale them to fit or print at 100% – either way, you should keep all important parts of the document. 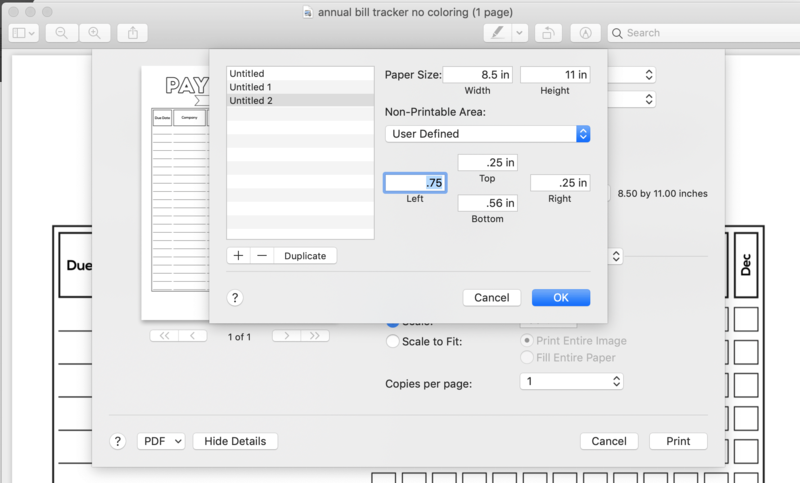 The non-coloring page bill organizers should fit just fine within standard printer margins. If you want to hold punch your printables without losing any of the coloring design or tracker chart space, set a custom margin for three hole punching. It’s super easy – just check out the steps below! Go to your “print” dialogue box. Add a new page. In Preview it auto-populates with 8.5×11 dimensions. If your software doesn’t, simply input them. You should also see a box where you can set the left, top, right, and bottom margins. Change the left margin to .75. 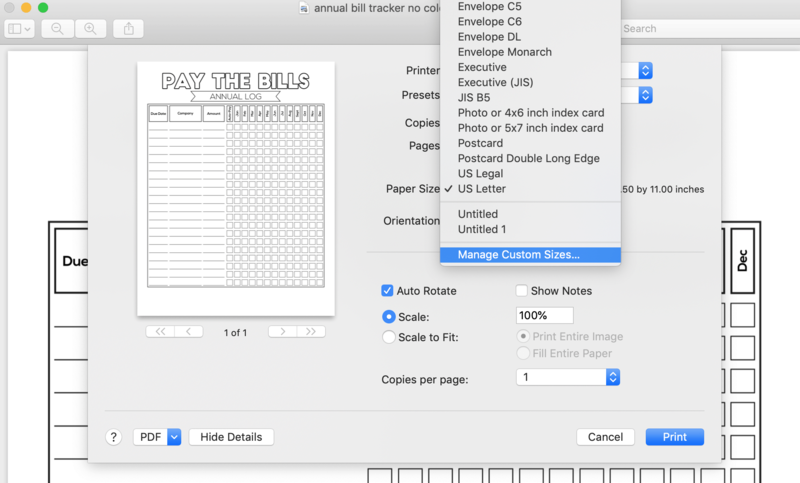 Just make sure you have this custom sheet selected when you print & select “scale to fit” and you’ll be able to hole punch without knocking out any of your tracker! 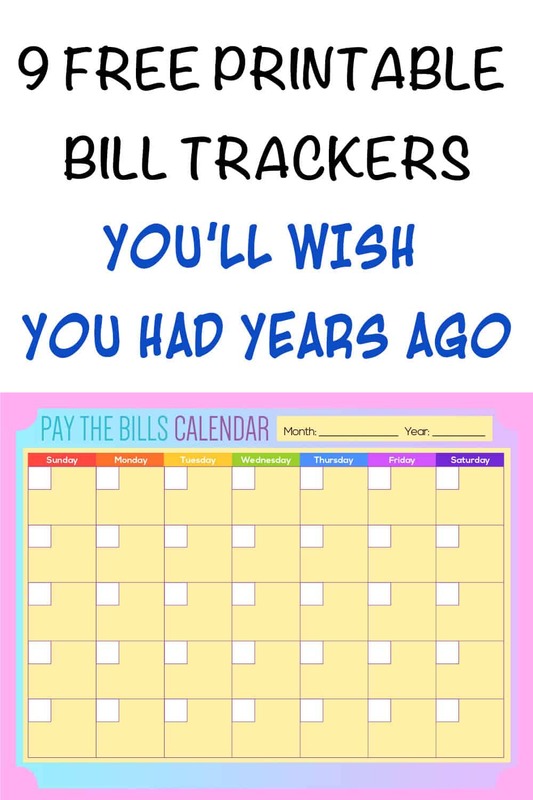 Let’s start with the most fun bill tracker! 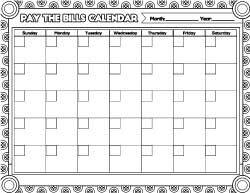 Coloring makes almost everything better, which is why I’m excited to share these printable coloring page occasional bill trackers. Please note that the images below are just low resolution previews – if you try to save and print them they will look horrible! Please look below the preview for PDF download information. 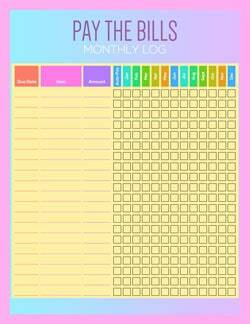 This monthly bill organizer helps you keep track of everything in one place! Use a fresh sheet for each month and record every bill when it arrives in the mail or your inbox. Write down the amount owed and when it’s due. Check, highlight, cross out, or otherwise designate that you’ve paid the bill once it’s paid! The third version has vibrant, lovely colors to help make your budget binder more cheerful! I always feel like full color sheets look best when printed on a laser printer. If you don’t have access to one at home, you can simply stop by your local office supply store or copy shop to get them printed. If you prefer calendars to charts, these are the printables for you! 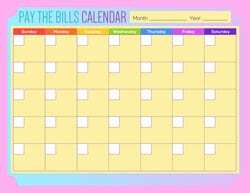 And there’s a bright and beautiful version of the monthly bill calendar! This chart is easy to use for recurring expenses with fairly consistent amounts like car/health insurance, cell phone, internet, etc. Simply write the name of the expense in the left hand column, check whether or not it is set to auto-pay, and check off when you pay each month (or when the auto payment goes through). And, finally, the colorful version! All of these bill payment checklists and logs are available in one convenient PDF file that lives in the Member’s Resource Library. 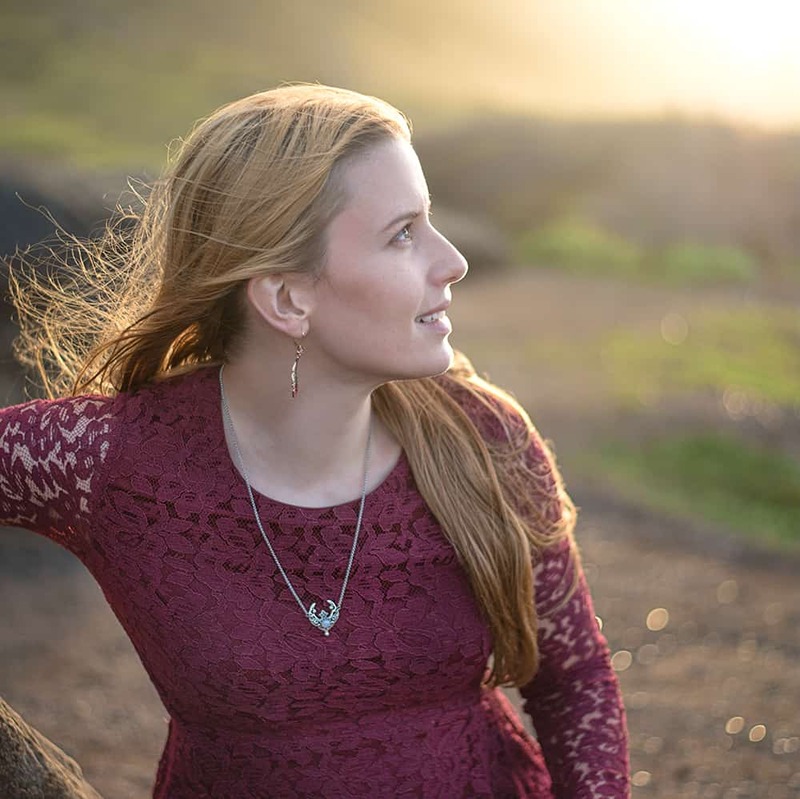 If you are already a member, you can head on over and log in! Don’t remember your password? It is in your welcome email and the footer of your most recent newsletter. Not an Artisan Life member yet? Just let me know where to send your password using the box below! You’ll receive instant access to these printables and everything else in the Resource Library. There’s lots of good stuff in there and it’s growing all the time! Alright, it’s time for more coloring pages! 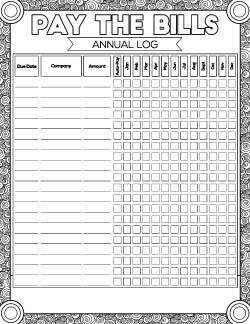 Maybe it seems strange to include coloring pages with bill trackers, but I think they’re really going to help you out. Your money mindset makes such a huge difference in your life. It can be tricky to have an abundance mindset when you’re paying your bills, but these coloring pages with wealth and abundance affirmations can help! I recommend really thinking on this affirmation while you color. Repeat it to yourself, internalize it, and make it reality! If you tell yourself that you make poor money decisions, you always have that thought to fall back on as an excuse. If you believe you manage your money wisely, you’ll start to make decisions that reflect it! The second affirmation is “I pay my bills before they are due to share the wealth with the company’s employees.” Again, thinking on and repeating the affirmation is beneficial! If you like these coloring pages, be sure to check back for more soon! 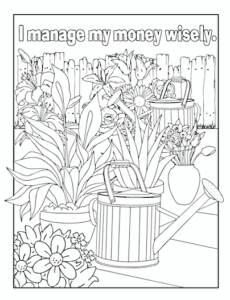 I have a whole set of these money-related coloring pages on the schedule. There are also more free printable coloring pages already available! Again, these files live over in the Member’s Resource Library! If you already have a password, you can head on over and log in! If you’re not a member yet, just let me know where to send your password and we’ll get you logging in right away! 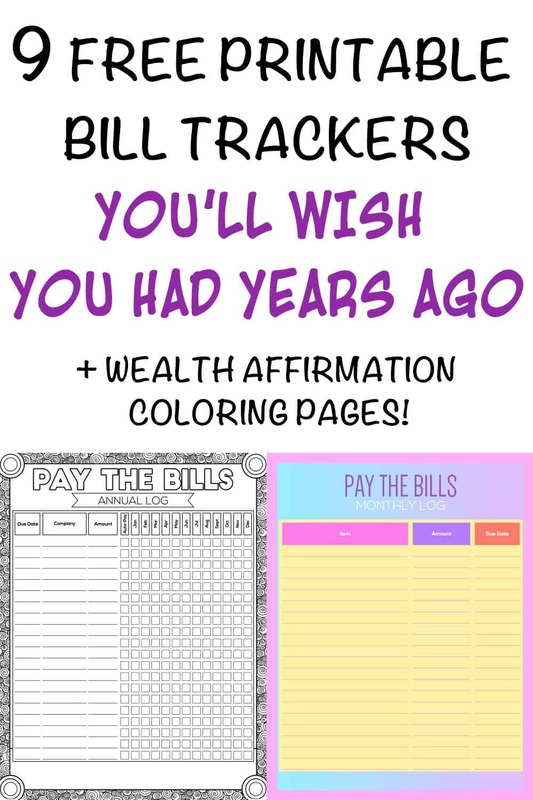 I truly hope you find these bill tracker printables and wealth affirmation coloring pages helpful! 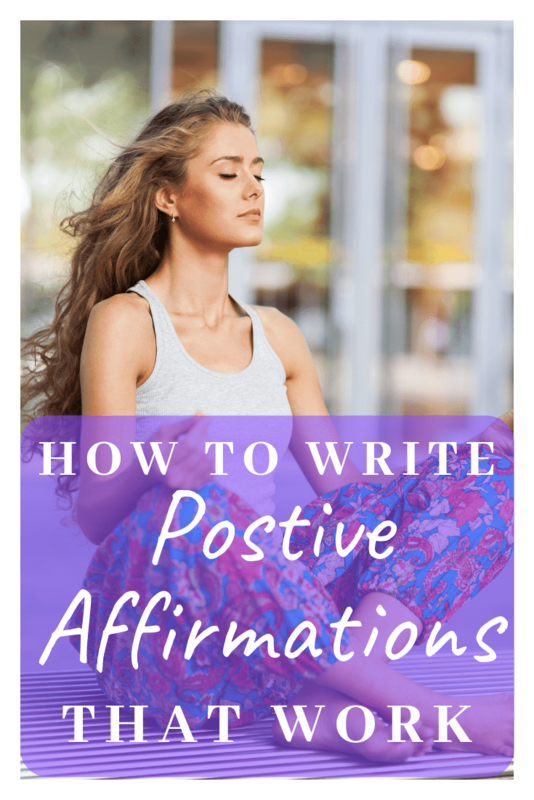 This post has great information on how to create affirmations that work if you’d like to write your own affirmations. I’ve also learned that without gratitude, you’ll never have enough. Learning how to be grateful for what you already have can bring so much more into your life! Discover how with this gratitude challenge.